I have a homemade bottle of Dit Da Jow and it comes in handy when I get injured in sparring, like I did today. By the way, it is sometimes spelled Dit Dat Jow, and in Mandarin Chinese it’s Die Da Jiu (跌打酒). Die is pronounced “dee-ye” not ‘die’ like in English. And Jiu is pronounced “jee-o”. The literal translation is FALL, HIT, WINE. But don’t drink it! 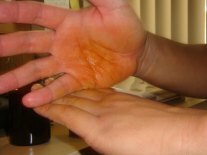 This remedy is for topical external use only. Two buddies of mine from class brewed a batch of Jow on their own and I was lucky enough to score a bottle. Three sprained fingers on my left hand, and my left thigh tenderized from all the round kicks to it. I have a few scuff marks on my lower ribs and abdomen but they’re minor and don’t hurt. First, I give the bottle a good shake. Jows are secret blends of dozens of herbs all brewed together in spirits (alcohol), or similar liquid. You're left with a powerful tonic. All the good stuff (the broken down herbs) settles to the bottom, so I give it a good shake to mix and break up the medicinal mud. Then I cover the open mouth with one hand and tilt the bottle, and tilt it back down. 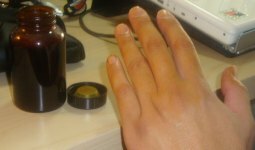 Now, I got healing Jow juice on my hand and ready to apply it. I've found there’s less mess doing it this way than trying to pour it onto my hand. And I don’t like to use cotton because it absorbs too much and gets wasted in the cotton itself. Now, I massage this golden elixir into the affected areas. I rub it in good. I want to make sure it penetrates, absorbs, and soaks into the skin. I think scientists call this form of treatment transdermal. Or, through the skin. As opposed to swallowing (oral), or injecting (intravenous), or rectal (up the you know what). I think it’s gorgeous. 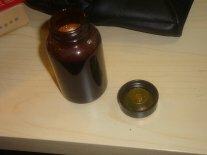 It starts out as a dark yellow-brown liquid, and when applied, it spreads out and turns into a gold-like color. Plus, it smells great! Licorice, mint, wood. Finally, I repeat this process and keep it up through the day, and maybe for the next couple of days depending on how bad my injuries are. For my sprained fingers I did it three times - I like the use of my hand, so I want it to heal quickly. My thighs, only twice. Legs can take a lot more punishment. I’ll probably do this two more times today and tomorrow too, especially my sprained fingers, which aren’t bending very well at the moment. I like to let the medicine do it’s thing. So I don’t wash it off. I’ll keep it there as long as possible and reapply right over it. It does rub off, though. So I have to be careful when I eat or rub my eyes. I don’t want to accidentally eat the elixir or get it into my eyes. That would be very bad. This is medicine, and it's very strong. 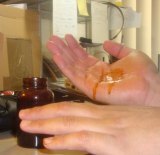 Avoid ingesting it and avoid applying it on open cuts. The Dit Da Jow stains are noticeable. Especially outdoors where sunlight makes it glow. 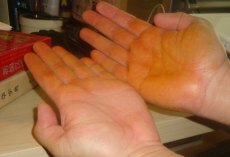 In the past, people have looked at me funny because I got florescent yellow-orange stains on my hands or arms. I just stand proud and tell them I got beat up in Kung Fu.